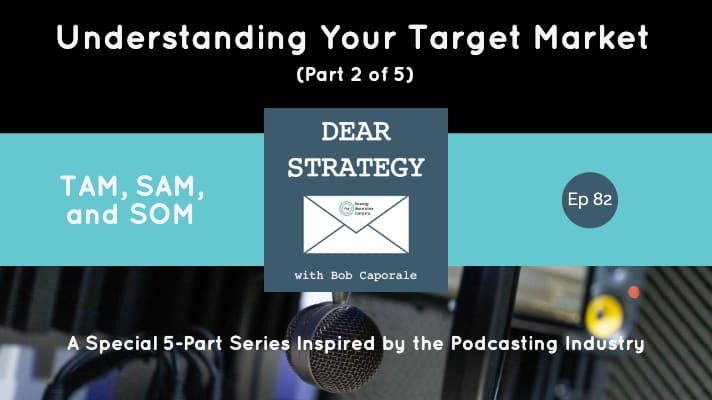 Continuing on in our 5-part series on Understanding Your Target Market (as inspired by the breakout session that I did for the Podfest Multimedia Expo in March 2019), let’s move right into the first step of this process, which is all about sizing up the market you want to go after. (By the way, please remember to catch up on this series by reading the post for Episode 81. Doing so will help put today’s topic into a clearer context). When I use the phrase “sizing up your market,” I am, to some extent talking about literally determining how big your target market is. But that part of the analysis is almost secondary to determining the overall “scope” of the market that you’re trying to reach. 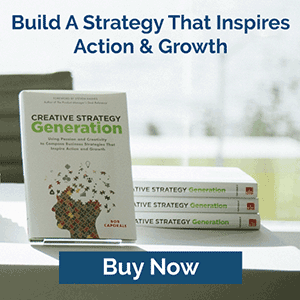 In other words, sizing up your market is all about breaking your overall market down into smaller chunks that you can more easily connect with. And to do that, we are going to use with a framework that is commonly referred to in marketing circles using the acronyms TAM, SAM, and SOM. I wish I had a catchier name to give this but, unfortunately, I haven’t come across one. And since I didn’t invent it, I’m certainly not going to use the old consultant’s trick of packaging it up with some fancy new nickname that makes it sound like I actually had anything to do with its creation! So, let’s just stick to the standard terms that most people already know and (almost) love. TAM – Stands for Total Addressable Market or Total Available Market, which refers to the total market that could possibly use your product. 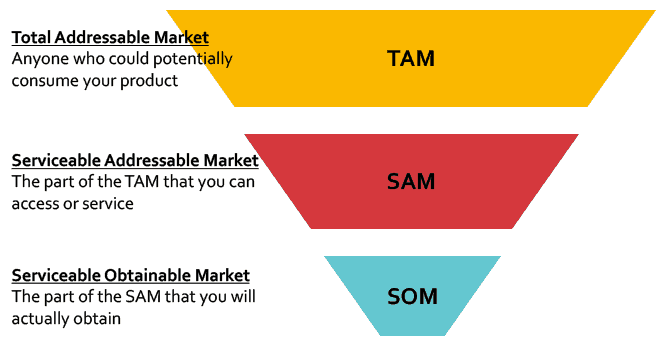 SAM – Stands for Serviceable Addressable Market or Serviceable Available Market (or sometimes Served Available Market), which refers to the portion of the TAM that you are actually capable of (or willing to) serve with your product. SOM – Stands for Serviceable Obtainable Market, which refers to the portion of the SAM that will actually purchase or consume your product. This more-or-less ends up representing your actual market share at any given point in time. To give this a visual, have a look at the diagram below. What you’ll find is that your SOM is a portion of your SAM, which, in turn, is a portion of your TAM. And all of this is meant to help you take an overwhelmingly large market and break it down into some targeted subsegment that is actually going to buy or consume your stuff. First, and this may be a minor quibble, but I have sometimes heard of TAM and/or SAM inadvertently being referred to as “Total Attainable Market” or “Serviceable Attainable Market.” The word attainable implies that you can actually get it, which may apply a bit more to SAM, but definitely would not apply to your TAM. So, I would try to avoid making the mistake of using that word altogether with respect to this analysis. On a slightly more meaningful point, the correctly used word “addressable” can have multiple implications as well. 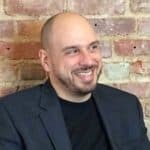 Sometimes, people will define TAM as being the total market that could possibly be addressed with your product, while, in other cases, some people prefer to define TAM as the total market that could realistically be addressed with your product. By way of an example, if my product is a podcast, I could define my TAM as consisting of anyone in the world who could possibly listen to a podcast (i.e. anyone who has ears). However, doing so might be a bit on the ambitious side. Instead, most podcasters would probably get more value out of defining their TAM as anyone who actually listens to podcasts. Of course, if your company was aiming to convert people who don’t listen to podcasts over to people who do, then I would probably recommend using the broader version of what could be considered “addressable.” But, in the case of a podcaster who simply wants to convert more podcast listeners over to his or her show, the narrower version of TAM would provide a more realistic analysis. The same discussion could extend over to our SAM. I can define this as anyone that I could possibly address with my product, or, the narrower version of anyone who I want to address with my product. In most cases, I prefer the latter definition as it allows me to equate my SAM with the market that I actually want to target. Targeting your SAM from your TAM. And that’s exactly what we’re going to cover over the next 3 posts in this series. And if anything that I’ve written here is at all confusing, please be sure to tune into the actual podcast episode by clicking on the link below. 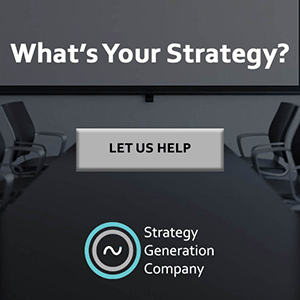 Or call us up at Strategy Generation Company for some training because, you know, that’s kind of what we do!